Ok...so lets take a quick walk down memory lane. Do you remember when your first child was born? Do you remember the sleepless nights, the long hours of baby's non-stop crying, giggly bath times and diaper blowouts??? Do you (mom) remember feeling a bit short-changed as you watched daddy snooze deeply throughout the night while you feed and comfort the baby? I do. My husband is a WONDERFUL father but definitely not a hands-on dad when baby is a newborn (and has only changed like 2 diapers in his lifetime as a dad). But you know what? I am OK with that. I totally understand his fears, his thoughts and his heart when it comes to having a new baby. In this generation of parents, I think dads are becoming more involved and I think it is VITAL for the family structure for dad to be a part. However, most dads need to be given the opportunity to be involved...so often the "mom instinct" takes over and moms want to be the primary nurturer and care-taker. But, when mom is ready for a break, dad doesn't feel he can step in because he has never been given a chance before. This is where things need to change. Recently, I have discovered a new program that has been developed with new dads in mind. I have NEVER seen anything like this and perhaps, if my husband had been exposed to something like this before our first baby was born, things would have been different. Dad's Adventure Launch Kit is a DVD and Book program that is designed to give dads a crash course in hands-on parenting. My six brothers and I grew up taking care of babies, which happens when your parents have 13 kids. To us boys, babies were like puppies; while a lot of work at times, they were fun to play with. They made great amateur wrestlers and you could always make them happy by the time mom got home. When my first child arrived, I was a natural at calming him when he cried and of course, making him happy. After four kids, other guys were asking me for advice, so I decided to help. It’s nice to be good at something important. In 1990, I recruited a few friends and asked them to bring their babies to the local hospital to show the ropes to some dads-to-be. When a few “rookies” said they had never held a baby before, we handed them ours and they went home thinking “I can do this.” They did, and later returned as “veterans” with their own babies to guide the next batch of rookies, and Boot Camp for New Dads was off and running. No women over 2’ tall were allowed; just babies and men. No question was stupid, no topic off-limits, like a “nursery in a locker room.” Boot Camp for New Dads now operates across the U.S., on U.S. military bases in Japan and Italy and in the U.K. and Canada. That small group of guys in 1990 has turned into more than 300,000 men prepared to be fathers. To me, I LOVE the idea of a Boot Camp for New Dads. This is EXACTLY what men need in order to feel adequately prepared for being a dad. So, for this review I was sent the Dad's Adventure Launch Kit. I was wondering just what this kit would cover and contain and I will tell you right now that it is AWESOME. It was really interesting to look at this from a mom's perspective too...I can totally relate to what these guys go through when they become new daddies. It is a scary undertaking and one that needs a bit of instruction. Babies don't come with instruction manuals...which is where this kit comes in. 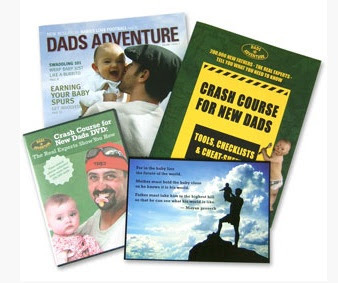 Inside of this kit you will find a Crash Course For New Dads DVD, a Crash Course for New Dads Tools, Checklists & Cheat Sheets Book, a Fathers Placard (containing reasons why dads are so important to their babies), and a Dad's Adventure Magazine. For me, the most interesting part of this kit was the DVD. It is 60 minutes long and had me giggling from the very beginning. Just seeing these rookie and veteran dads in action was sooo amazing. One of my favorite quotes from this DVD was when someone said "Men aren't supposed to know anything about babies, but women are EXPECTED to know EVERYTHING." (The quote may not have been exactly that but it was very close!) How true is that?!? Women are just "born" to know, yet men are masculine and aren't motherly at all. This DVD obviously kicks that idea right out the window. This DVD walks dads through labor & delivery concerns and surprises, bathing, feeding, burping, changing and keeping a baby happy. In fact, there is a scene where a daddy is swaddling his newborn and WOW! He did a fantastic job! I was floored. This DVD is very fast moving and attention grabbing as well (and FULL of beautiful babies too!!!). The book is also a tremendously helpful resource for dads. It contains pull-out pages on which dads can take notes, record things and learn tips and tricks. This Dad's Adventure Launch Kit is available from the Dad's Adventure website and retails for just $24.95 and I guarantee you...it is worth every penny! I wish-I wish-I WISH I had known about this when I was pregnant with my first. I cannot even tell you how much my husband would have benefited from it. But, I plan on having him watch the DVD and giving me some feedback...it will just be fun to watch his reaction too. So, in my opinion...Dad's Adventure Launch Kit is a superb resource for any new dad. If you are a mother expecting her first baby, or you know a guy who is going to be a first-time dad, this would make a wonderful gift for him. He will thank you for helping him be prepared. Nothing is sugar-coated in this kit...it's all there to be discovered and learned. I LOVE IT!!!! Visit Dad's Adventure, then come back here and leave a comment letting me know something you learned and why you want to win this kit. :) You do not have to be a blogger to enter, but you must have a valid email where you can be reached should you win. If you do not leave an email address, it must be where I can easily find it. This giveaway is open to US residents and will end 9/6 at 11:59 pm EST. The winner will be chosen using random.org and will be notified by email. The winner will have 48 hours to respond, or another winner will be selected. 1. "Like" Dad's Adventure on Facebook. 2 entries, so 2 comments. 2. Follow Dad's Adventure on Twitter. 2 entries, so 2 comments. Disclaimer: I received no monetary compensation for this post. I did receive a Dad's Adventure Launch Kit for review purposes. 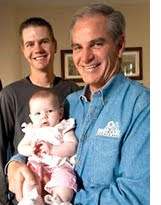 All quotes and stock photos are from the Dad's Adventure website and email. All thoughts and opinions are 100% mine. I learned that they've been around for 20 years. I'd like this for my husband because he's scared of having children and I think this would ease those fears. i love that they give some support to new dads- and in an honest, humorous way! I learned that they have great step by step videos for a lot of activities that new dads may be afraid of... I want to win this for a friend who will be a new dad in March! I love all the activity ideas they have and the way they make it not intimidating. I learned that their site has free tips for Dads! I'd like to win this because it would make a great gift and it acknowledges the importance of the father's role in the family. I learned that they have a really cool "Ask a Dad" section where dads can submit questions and share pieces of their own advice. I'd love to win this for my brother. He became a Daddy this past Monday for the first time!!! LOL - I learned they have a Boot Camp for New Dads!! That's hilarious!! I would LOVE to win this because hubby and I are planning on trying for our first baby in the next few months and he doesn't have a CLUE about parenting in the least! He is one of 2 children, the youngest in his family, and has a very small family so he has never really been around children or babies! I come from a large family, with 8 siblings, almost all of them younger than me, so I have been around children my whole life! It's funny I came across this giveaway because I just got done telling hubby the other night that we have GOT to get him to start reading some books on this stuff! I am following you through GFC under Tina R.
They have videos for a lot of activities that new dads may be afraid of.I want to win this for my brother who will be a new dad in October!